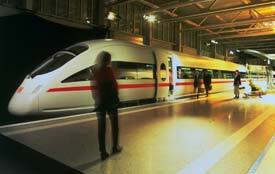 The Deutsche Bahn's high-speed 'Intercity-Express' trains connect cities throughout Germany. ABOVE: An ICE T train of the German Federal Railways. INSET BELOW: An ICE 1 train in the German countryside. France's TGVs, Japan's Shinkansen "bullet trains," and Eurostar may be better-known to English-speaking foreigners, but the Intercity-Express or ICE trains of Germany have been providing high-speed rail service on the Deutsche Bahn, or Germany Federal Railways, since 1991. On any given day, more than 150 ICE trainsets connect German cities at speeds of up to 300 km/h or 186 m.ph., with some routes extending into neighboring countries. The busiest stretch of the ICE network, the Riedbahn between Frankfurt and Mannheim, has a capacity of 280 trains per day. For you, the statistics translate into speed, frequency, and convenience: Intercity-Express trains are, quite simply, the best way to travel between most German cities. Even on long stretches, such as Berlin to Basel, train travel is competitive with flying after you've factored in ground transportation and other hassles. In this article, we'll describe what it's like to ride an ICE train, tell you how to buy tickets or use your rail pass, and point you to other Web resources for Intercity-Express passengers and railfans. Photos copyright © Rail Europe.